The Mediterranean Sea has been the key natural medium for the trasmisión of old civilizations. Phenicians, Greeks, Romans sailed the Sea to conquer other territories. Therefore, it is logical than the origin and expansion of wine culture is closely related to the Mediterranean Sea. Although the first track of grape juice was found more than 5,400 b.C in the current Middle East area, the Mediterranean Sea was the quickest and most comfortable via for wine transport. The old Egyptian civilisation had advanced wine- making techniques. In the archeological sites, experts have found presses and amphorae for wine. Around 800-600 b.C, Phoenicians, the great trade people in the Mediterranean, started expanding vine- growing and wine-production. They had a very large knowledge and they planted vineyards according to climate and soils. In fact, in Valdepeñas region there are archeological tracks of vine- growing due to Phoenician influence. In the archeological site Cerro de las Cabezas (6th- 2nd century b.C), some clay containers have been found, as well as other vine- growing tools. The most important Mediterranean civilisations were the Greeks and the Romans. During centuries they had the control of the Sea, and it is from them from whom Spain has inherited wine- making and wine- consumption culture. 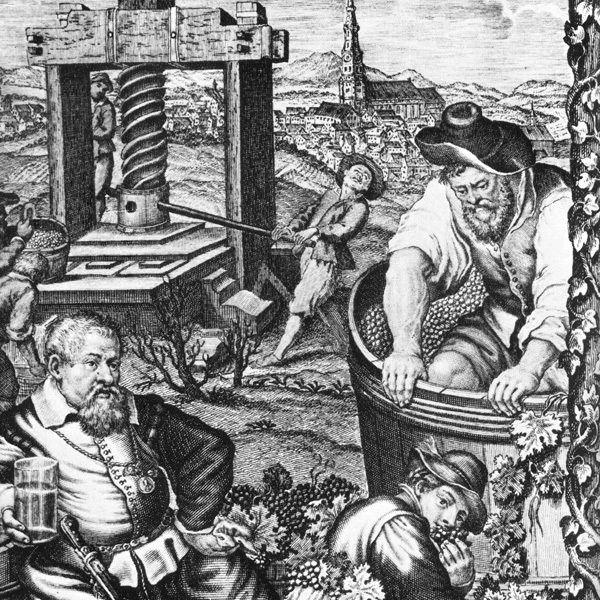 The profesionalised the wine- making and gave wine a certain status, being it used in religious rituals, celebrations, etc.